Sanctum had the potential to be a disaster to the point when the cast, director and producers alike would have attempted to revise the fact that they had been apart of the film. But Sanctum is not a catastrophe movie and it is surprisingly gripping. 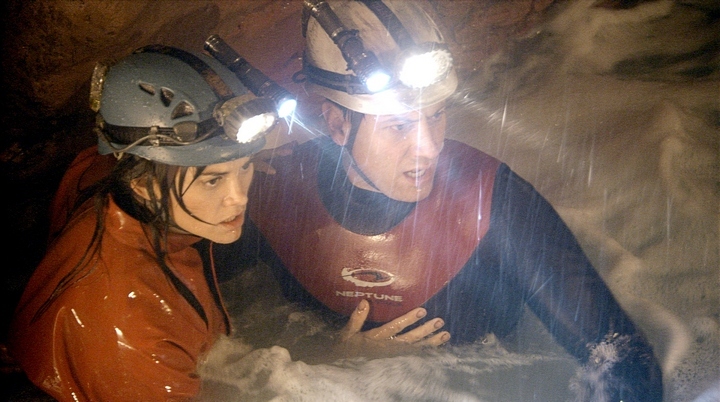 Victoria and Carl begin to panic as they realise that they are trapped and the cave is flooding. The film is ‘inspired’ by true events. (What this means is anyone’s guess.) A group of cave divers attempt to see the last unknown, underwater cave in the world in Papa New Guinea. The divers, led by Carl the manager (Ioan Gruffudd – Titanic, King Arthur, Fantasic Four I & II), Frank (Richard Roxburgh – Mission Impossible 2, Moulin Rouge, Van Helsing), Josh (Rhys Wakefield – Home and Away, The Black Balloon), George (Dan Wyllie – Chopper, Animal Kingdom) and Victoria (Alice Parkinson – Where The Wild Things Are, X-Men Origins: Wolverine, The Pacific) are slowly but surely revealing the depths of the cave. That is until a storm breaks out above them. Before they know it, the cave is flooding. They are trapped. The only way out is down. Down, through previously unexplored areas. Carl, left, and Frank, right, stay still for a moment to let the others catch up. 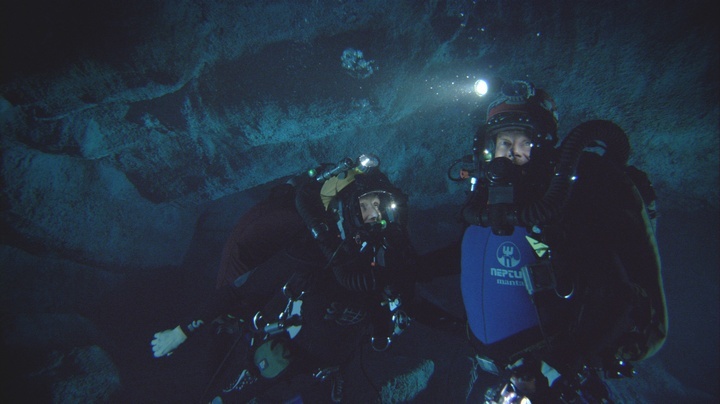 Behind them, one gets a glimpse of the awesome underwater scenery that is prevalent throughout the film. The 3D feature of the movie has the further effect of making the audience feel as trapped as Frank, Carl, Josh, George and Victoria. This is in no small part due to the executive producer, James Cameron (Titanic, Avatar I, II & III). Just like in his last film, Avatar, Cameron successfully exploits the 3D effects to make one feel like they are in the predicament of those they are watching. In addition, his 3D images of the caves are stunning; seductive enough to make one believe that the potentially fatal dangers of cave digging/exploring are non-hazardous and worthwhile. 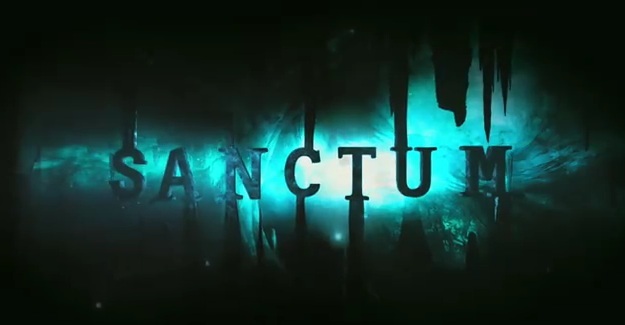 Arguably, the visuals and the 3D effects in Sanctum, to a degree, make up for what is lacking in the acting department. The director, Alister Grierson (Kokoda: 39th Battalion), and Cameron make the most out of a bland storyline; and turn it into an unexpectedly entertaining and nerve-shredding movie. This entry was posted in Based on Real Events, Thriller and tagged 3d, based on real events, cave divers, fantastic four, film, iaon gruffudd, review, reviews, sanctum, titanic. Bookmark the permalink. Sanctum was a MASSIVE disappointment!!! I can’t believe James Cameron gave his name for this… Well, in fact I can’t believe he even did anything creative in this utterly boring film, full of clichès and terrible lines of dialogue. Yes, OK, nobody should go and see a movie like this for the dialogue, but still, if you watch an action flick you want some good characters to empathize with. In this film everyone is so annoying and disgusting that you actually can’t wait for them to die! I have read your review. I enjoyed it and I agree with a lot of it. Although, I must say, I did find it pulsating and enjoyable if predictable. Yes, the characters lack depth and one can’t empathise with them; I have made this point. Three out of five might be a bit generous on my behalf. I always try to praise films where praise is due; and, for me, the 3D visuals had the wow effect on me. I also went in with no expectation, which helped me enjoy it more. Btw, I have a strict criteria on how I analyse films and what rating I give them. I haven’t written them up yet on the blog though. Do you have something similar? Or how do you rate your films?